A while back, I wrote about home servers and compared Apple's new AirPort Extreme with Microsoft's recently announced Windows home Server (see Who Needs a Home Server?). In the end, I bought neither and opted instead for the low-end alternative, a NAS drive. NAS stands for Network Accessible Storage, and while many such products are quite expensive, I picked up the SimpleShare 250 GB model for $90 from Newegg.com (it's listed at $99.99 this morning). Here is my impression of it after about three weeks of use. First, I'll describe the unit itself. It looks like nothing more than an external 3.5" desktop-sized hard drive with a pair of slip-on plastic feet. 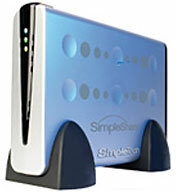 Where a conventional external drive would have either USB or FireWire ports on the back, the SimpleShare has a pair of USB ports and an ethernet port. By the way, the USB port can't be used to connect the drive directly to your computer; they are for connecting additional external USB hard drives, which will be seamlessly added to the storage pool, or to connect a printer and use SimpleShare's built-in print server. There is no fan, and therefore almost no noise, though the drive inside the case does chug a bit when accessed. It gets slightly warm to the touch, but never hot, and it generally attracts little or no attention to itself. The SimpleShare uses an embedded Linux operating system and is configured through a Web interface. There are options for setting up shares on the drive, setting a Windows workgroup name (sorry, no domain membership), and password protection, if you want it. Supposedly there is SMB connectivity for Unix and Macs, but I couldn't get it to work and just used Windows networking to connect it to my iMac, which was extremely easy to do in OS X. Sharing worked instantly on Windows as well, without any headaches. What was a headache and occasionally remains one is the print server function. I previously used the built-in print server on an AirPort Express and expected things to be just as easy here - but was rudely disappointed. Yes, the SimpleShare recognized my printer instantly, but getting it to work on my iMac took a bit of trial and error. My PC found it and could print right away. Even now that its properly configured and working on both the iMac and PC, the PC prints instantly, while the iMac has about an 8 second delay before a print job makes it to the printer. I'm not sure if it's the Brother driver for OS X that has always been a poor cousin of the Windows driver or an issue with the SimpleShare print server itself. Okay, so setting it up was a bit more difficult than the advertising copy promised, but how is it now that things are up and running? Is it a worthwhile substitute for a home server or other shared storage solution? Simply put, it's okay. This unit was very cheap at $90, and it's limited to only 10/100 ethernet speed despite all of my computers having gigabit ethernet capability - since I share it over wireless, that doesn't matter. Another downside that I alluded to above is that the Linux configuration tools are far more geared toward PCs than Macs, so much so that I gave up on the Mac instructions and just relied on OS X's Windows file and printer sharing. Then there is speed - or lack thereof. This, however, will be common to any network share, not only to an NAS drive. The simple fact is that wireless G or even 10/100 ethernet is far slower than an external hard drive connected by FireWire or USB 2.0, though a bit faster than USB 1.1. It's fast enough to stream audio, but too slow to stream high-definition video. For centralized backups, shared file storage, and printer sharing (for PCs and patient Mac users), it's a terrific solution for the cost. If you want to stream high-definition video, however, this is the wrong device. I don't stream video. I needed shared storage mainly for backups and archive purposes, and for that the $90 SimpleShare NAS is just about perfect. Were it significantly more expensive, however, I would have pursued a more powerful and faster option.